An occasion that is steeped in tradition and formality, Installation Day is an event that commemorates the election of new prefects and reinstallation of existing ones. 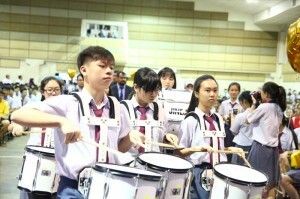 This year however, Sekolah Seri Suria decided to add a little twist to proceedings by coming up with a theme – “Unmasking the Future”. 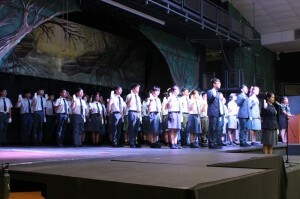 Symbolically, with this chosen theme, the new batch of prefects officially announced their arrival as responsible, influential and positive role models who would lead others to strive in the right direction whilst proving their capability of being a student liaison figure and trusted confidant. Witnessing the ceremony on 14th February 2017 at the school’s Hall of Character, students and teachers from the Senior section were both thrilled and curious to see the Surian prefects donning masks as they marched into the hall and saluting the crowd as they made their way onstage. Certain formalities however, were true to form as the new Head Prefect led his peers in an oath-taking ceremony, where they pledge to lead by example and carry out their duties faithfully. An eruption of applause from the crowd duly signified the start of the new Prefectorial Board’s tenure. The proud new members of the board then received their official installation scroll, followed by the reinstallation of existing prefects. 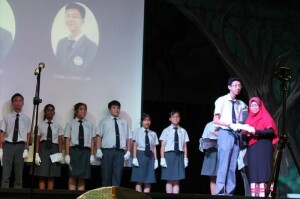 Arguably the most eagerly-anticipated moment of the event took place when the names of the higher board members were announced, with Chew Liyan earning the coveted title of Head Prefect while Khairil Ridhwan was appointed Assistant Head Prefect. The ceremony concluded with an inspiring video presentation and magnificent performance by the new board. To be a Surian prefect is to possess outstanding leadership skills and all-round attributes. They are ambassadors of the school who provide assistance during a number of school functions as well as other tasks that are assigned by the Principal or Prefect Coordinators. As guardians or custodians of school rules and codes of conduct, they are expected to exhibit exemplary behaviour and maintain high moral standards and discipline at all times. It is hoped that this latest batch of prefects would embrace and honour the trust bestowed upon them by performing their role to the best of their ability. The post Unmasking a Bright Future with Surian Prefects appeared first on best international schools in malaysia.